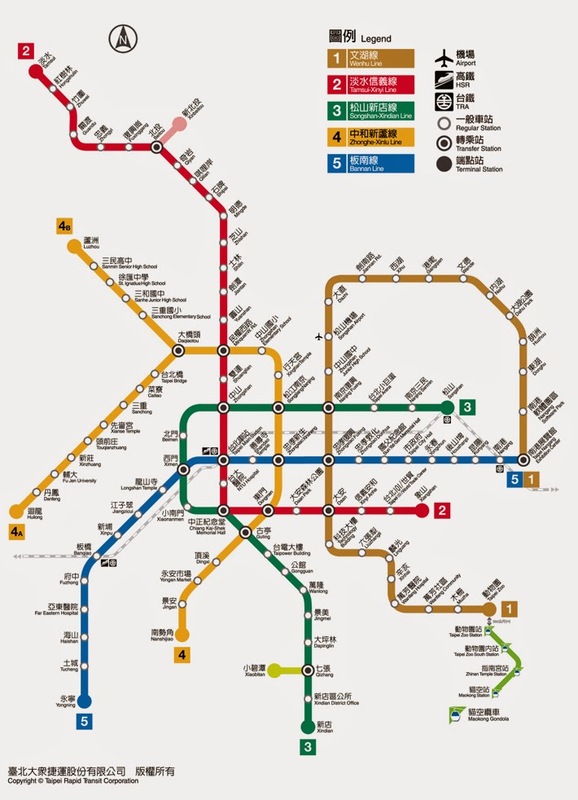 Taipei's Mass, Rapid Transit (subway) system is the best way to get around the ever-expanding sections of the capital it covers. It's fast, efficient, affordable and remarkably easy to navigate, even for someone with no experience with large-scale public transport. From MRT Homepage. Click to enlarge. The MRT is a fairly typical light rail system, most of which is underground (a subway), but it also includes some areas raised above the road (like the Bangkok Skytrain) and the northern end of the Tamsui (red) line runs along the ground like a traditional train, but (unlike Bangkok) all are connected as one system. Trains on the Muzha (brown) line are driverless. Most of Taipei, especially central areas popular with tourists, is blessed with footpaths (sidewalks), and there have been recent, overdue moves by authorities to return them to their intended use (by confiscating the scooters, cars and whole shop fronts which illegally occupy them), so walking Taipei can be an interesting and enjoyable experience, especially during the spring and autumn when it's not too hot. Outside of Taipei, however, the footpaths are generally more like scooter paths / parks where they're not fully taken over by other commercial enterprises, and walking can be an unpleasant if not dangerous experience as it's usually necessary to walk out onto the road, among the sea of scooters - often moving in both directions. Even in Taipei, however, it's always good to be on the lookout for approaching scooters from every which way. Taipei has no shortage of taxis! Taxis in Taipei are cheap, plentiful and remarkably honest. Flagfall starts at 70NT (more in smaller cities), and a short trip to or from the nearest MRT stop is unlikely to cost much more than 100NT. Especially if you have a few people, or are just under time pressure (or suffering from heatstroke) taxis are great for short hops around Taipei. Unless you have a Chinese speaker present or on the phone, never get into a taxi without the address you want to go to written in Chinese, or on a tablet or smartphone. Here's why: Few taxi drivers in Taiwan speak English, and because Chinese is a tonal language, a non-Chinese speaker attempting to read Chinese phoenetically won't make any sense to anyone, and a taxi driver probably won't even realise the person is trying to speak Chinese. Also, unlike their Chinese cousins who learn Chinese using pinyin, a romanised phoenetic system, Taiwanese learn Chinese using an older system called Zhuyin (also known as 'bopomofo'), and as a result most Taiwanese will not recognise street names or addresses written in English. To further complicate it, the romanisation of Chinese is inconsistent, and being a political issue it's not likely to be resolved any time soon. So Zhongshan Rd can also be written as Chungshan Rd, and two signs at the same intersection are often written differently. Also, sometimes road names are translated (especially on road signs) but written phoenetically on maps, especially Google Maps. So 'Park Road' may be written as 'Gong Yuan Road' on Google Maps. Finally, long roads are divided up into numbers, which are further broken down into sections. So Chungshan 5th road is not the same as Chungshan Rd Section 5. While confusing at first, Taiwan's address system is very logical, and an address written down in Chinese will have all this information with no ambiguity. Addresses are written on most buildings on distinctive green signs, and an increasing number are bilingual. I recently broke my own rule and had my first bad taxi experience in many years here. I asked to go to "Min-An Street" and the taxi driver looked confused and wrote down a suburb I didn't know, and "Min-An Road". Not noticing the street/road, I waited for ten minutes or so for my tablet's GPS to kick in, and eventually ended up with an expensive taxi ride to a neighbouring suburb, with a much larger Min-An Road than where I wanted to go. There was more the taxi could have done, but really my fault for not having the complete address written down in Chinese for him. At the right times Taipei's bus system can beat the MRT for price and efficiency, and it's usually possible to get from anywhere to anywhere quite directly, without needing to walk up and down stairwells. They used to be so complicated that the effort required for a single ride was well beyond what could be expected of a short-term visitor, however with a recent increase in English signs and Google Maps it's now easily possible to take a local bus if you have a tablet or smartphone with a data connection. Just check that the bus is going where you thought it would after you get on. However, it's rumoured that bus drivers are paid according to the number of passengers, and true or not Taipei bus drivers will often let passengers on anywhere, take off before they sit down and often even appear to be racing with each other on the busy routes, often cutting in front of each dangerously. So taking a public bus in Taipei is not for the faint hearted. Hold on tight, and don't try to read from a smartphone or take photos out the window, or you and your phone/camera may both end up flying to the front of the bus - or the back when s/he finds a gap in the traffic too good to turn down. This is a stark contrast to the comfortable rides on intercity buses in Taiwan. 1. Have the correct change with you. Buses don't take change. It's almost always 15NT. Break that 100NT bill at the convenience store over the road first before you get on the bus. Or even easier, just use your Easycard, in which cases use of buses either side of the MRT is half price. A sign above the driver will instruct whether to pay when getting on or off. 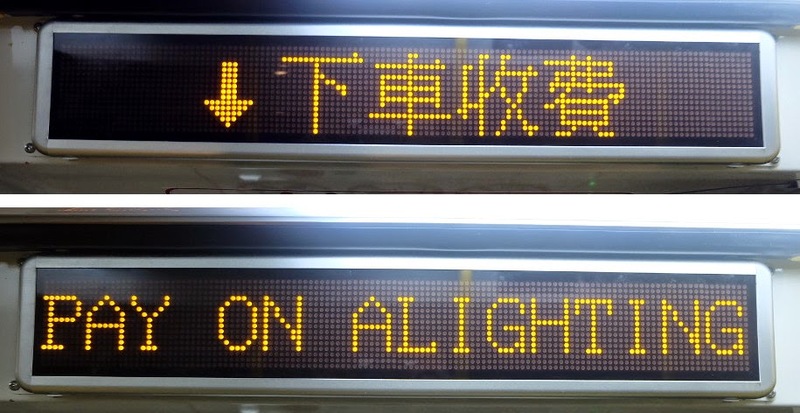 The second character lit up instructs passengers to "pay on alighting". Don't count on English translations on all buses. 上 = pay when you board the bus. 下 = pay when you get off the bus. 上車 = board the bus (as in climb up on board) 車 = get down off the bus (formally translated to 'alight' from old English). Bus routes are divided up into zones, with most commutes being within one zone. If a passenger crosses a zone they need to pay twice (even if it was a short ride just across the zone border, but this is unlikely to happen often). So the bus starts off 上車, and everyone pays when they get on. Everyone who gets off within that zone does so without paying again. When the driver crosses the border s/he changes it to 下車, and from that point no one pays as they get on, but everyone pays as they get off, resulting in only those who have been on since the first section paying twice. While the system is confusing to newbies, it's very efficient, if a little confusing at times. Bilingual signs are becoming more common, especially in Taipei City, but don't rely on them. Like everywhere else in Taiwan, bus signs are becoming more bilingual, and these newer signs alternate between Chinese and English. While even the older sign above has some English guidance, it's important to remember the two characters 上 (for boarding) and 下 for getting off ("alighting"). Youbikes outside Gong Guan Station. 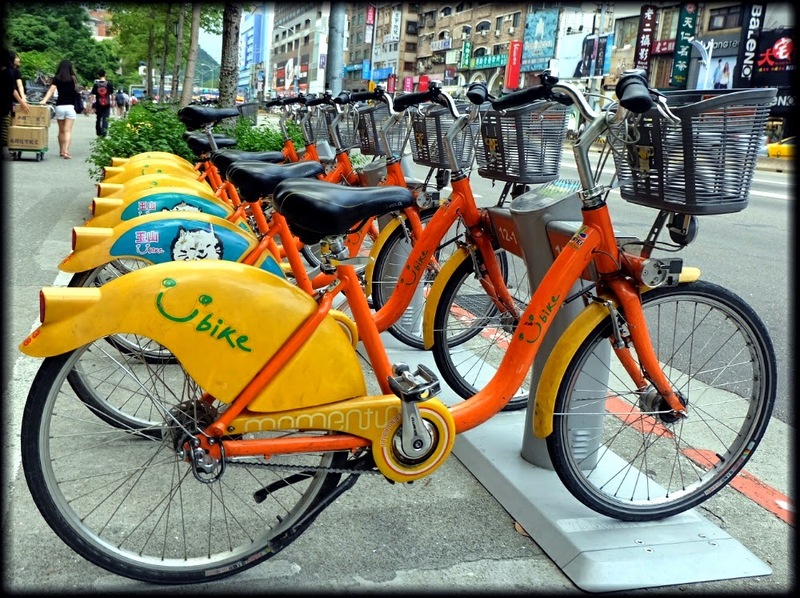 Cycling in Taipei is, at times, a pleasant way to get around, however there is a dire shortage of secure parking spaces for bikes, and theft is a big problem, so do NOT leave your good touring bike anywhere out of view, not matter how securely locked up you think it is. Instead use Youbike.